At the start of each year, Southern California gets a glimpse into a future of rising seas, through an annual event called the king tide. On that day, the sun, moon and Earth align to create a heavy gravitational pull, leading to the highest tides of the year. If “king tide” sounds ominous, that’s because it is, particularly for a city like Imperial Beach, a small coastal town near the Mexican border surrounded by water on three sides: San Diego Bay to the north, the Pacific Ocean to the west and the Tijuana River Delta to the south. It doesn’t hurt that there’s a king reference there either, from my POV — because? As a Brit, I was introduced to King Canute at an early age, along with every last one of the other Kings and Queens of England — and their dates — memorize them! Americans, however, have shaken off the dust of kings and queens, and may not know the tale of King Canute and the waves. Was he, as my gold-embossed, colour-plated richly patriotic children’s book had it, an imperious royal who set his chair in the sand before the incoming tide, and not about to lose one inch of English sovereign soil to the waves, dared the Atlantic to encroach on his royal prerogative? Or was he, as Henry of Huntingdon, the original chronicler of the tale has it, a humble and wise, one might say ecologically sound king, who set his chair in the sand to demonstrate to his fawning and flattering courtiers that look, not even my royal command can overrule the laws of God — or Nature? So, back to the humbling question — rising tides? Currently an anomaly, the king tide is a portent of things to come. Researchers warn that, due to myriad factors including the Earth’s rotation, California will deal with even higher sea-level rise than other locations, as the atmosphere and oceans warm. The oceans are now rising at a faster rate than any time since the last Ice Age, about half an inch or more per decade. While much of this is understood by researchers and informed readers, very little has been done by coastal cities to confront this slow-moving catastrophe. And Imperial Beach in particular? That is what makes Imperial Beach so interesting. 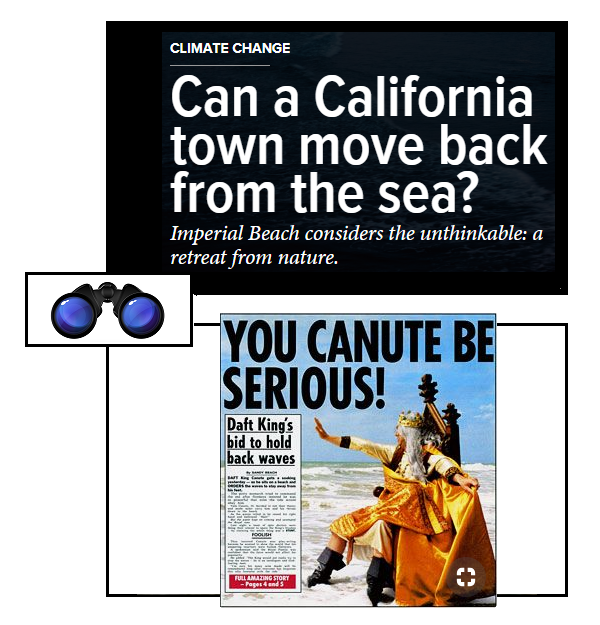 Here, at the southernmost beach town in California, in an obscure corner of the United States, one small city is asking: What if we just got out of nature’s way? High Country News, Can a California town move back from the sea? This entry was posted on Monday, October 22nd, 2018 at 4:56 am	and is filed under britain, california, Charles Cameron, climate, crisis, Doublequotes, Evolution, historians, history, monarchy, myth, recommended reading, report, Uncategorized. You can follow any responses to this entry through the RSS 2.0 feed. Both comments and pings are currently closed.